One of the most common complaints heard by dentists is from patients who want to improve the appearance of their stained or discoloured teeth. At Dental FX in Glasgow, we offer a wide range of treatment options for patients whose teeth are discoloured or stained. The best treatment for you will depend on the nature of the staining/discolouration, and on your individual needs. If you are unhappy with the colour of your teeth, the first step is to book a consultation with a cosmetic dentist here at our Glasgow practice. 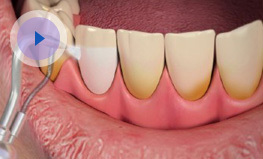 In many cases, all you need to remove stains from your teeth is an appointment with a dental hygienist. At Dental FX in Bearsden, we have three hygienists – Nicola and Michelle – who are key members of our preventative dentistry team. For stained or discoloured teeth, your hygienist can use the Airflow machine, which uses compressed air, fine powder particles and water to remove plaque build-up (which can cause discolouration) and even the most stubborn stains from the teeth. We see fantastic results from the use of the Airflow and patients love this. Our teeth become stained through drinks such as tea, coffee and red wine, and through habits such as smoking. Some mouthwashes and medications can also stain the teeth. Teeth whitening treatment uses special bleaching gel and bespoke whitening trays to gently and safely remove these stains and renew the natural colour of your teeth. Your cosmetic dentist will check you are suitable for teeth whitening treatment and will take impressions of your teeth so your whitening trays can be made. We offer a same-day service for this, as your trays are made onsite. Treatment is carried out at home and takes about two weeks. 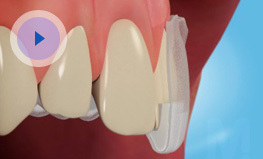 Veneers are thin pieces of porcelain or ceramic that can be placed over the front surface of a tooth that is permanently stained or discoloured. They will be closely matched to the natural colour of your teeth for a realistic looking result. We offer a same-day veneers service at our Glasgow dental practice.